Y’all knew my break from reading Stephen King wouldn’t last long! This may be my last King book for the year — it’s certainly the one on my to-read list for this year… there’s only a few left now! Next up is Misery: about a writer that is held captive by his #1 fan. Popularized by the film starring Kathy Bates, I was excited to work my way through this one. I also rented the movie (because why not?) to compare. 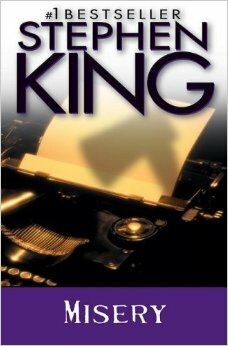 King’s work has always stuck with me, and I’m glad I finally read Misery. It might not be my favorite, but Annie Wilkes is a stand-out, unforgettable character. Many already know the story, but to recap for those that don’t, Misery is about a writer, (as so many King books are) Paul Sheldon, who has a car accident while driving in a snow storm and is saved coincidentally by a big burly woman, Annie Wilkes, who happens to be his number one fan. She also just happens to be cockadoody crazy. Annie nurses Paul back to a some-what better health than before. As a kind of sick payment, she forces Paul to write a sequel to her favorite book series he wrote. In the meantime, she’s got him hooked on pain killers and confined to a single room. I love books that get a reaction from me, and I found myself really cringing at some parts: especially the iconic *SPOILER* axe-to-the foot *END SPOILER* scene. Also appreciated was the background on Annie through her scrapbook. In fact, I would have loved reading even more, especially with her family, her college days, knocking off all those people in the hospital, her marriage… Long illness, short illness, whatever the case, Annie is one dirty bird that I can’t get enough of. Can there be a prequel please?? Yes, the premise of the book is interesting, but I find it to be more of a character study on poor Annie here. How often do you read a book that’s like a moving portrait of a person? This book made me think about those times I’ve blathered on in front of authors I’ve met. Honestly, hanging around someone day in and day out for nearly a year like in Misery would tarnish their image for me. Once you realize authors, (celebrities, etc) are really just people, and they live boring lives just like the rest of us, it’s just not as exciting anymore. So let’s keep things exciting! Let authors roam free! Verdict: READ THE BOOK. Though the movie was good in its own way, this is yet another Stephen King book that lives a better life on the page than on the screen. Absent from the movie are the cut-a-ways to Paul’s in-progress novel, Misery’s Return, which I found oddly fascinating. And what happened to the axe? Instead it’s a sledgehammer? Hey, at least Annie Wilkes is still cooky, somehow lovable, yet despicable. Kathy Bates made the movie. I don’t often say this of adaptations to the screen, but Misery the movie was a very watered down version of the book. It’s like weak tea. It’s still tea, you still get the smell and taste of tea, it’s just not as flavorful. Misery the book ranks high on my most-liked King book list. The movie… needs to be steeped longer! Technically I listened to this book, and the audio is amazing. Brilliant job!